Whether you're a New England fanatic or a Patriot hater likely determined your mood this morning. Those cheering on Brady and the boys will likely spend the entire day re-living the Pats' epic comeback against the Atlanta Falcons in Super Bowl 51 last night. Down 28-3, New England scored 31 unanswered points from the 2-minute mark of the third quarter on to capture a 34-28 overtime victory. The game was historic for a number of reasons, most notably that Tom Brady both broke the single-game Super Bowl passing record, and captured a record-setting fifth Super Bowl title and fourth Super Bowl MVP. It was also the first overtime game in Super Bowl history. In the process, Brady bounced back from an opening three quarters of getting beaten and bruised (and let's be honest, looking frazzled while missing some WIDE OPEN receivers), to find his usual flawless form, and deliver pinpoint passes on the final five drives of the game. But the moments Pats fans are likely re-living the most are Julian Edelman's ABSURD catch in traffic, and James White's game-winning touchdown run. Both plays will no doubt become a part of Super Bowl lore, next to recent moments like Tyree's helmet catch, Holmes' end zone snag and Butler's goal line interception. Of course, the other side of that coin is the collapse of the Atlanta Falcons. Atlanta dominated the first 40+ minutes of this game, building a 25-point lead behind the arm of league MVP Matt Ryan, the stellar running of Devonta Freeman, and the surprisingly dominant play of the Falcon front-seven. But, New England began to find itself offensively late in the third, switching the the no-huddle and tiring out Atlanta's big guys up front, then victimizing the Falcon corners who seemed to show a total inability to turn around and play the ball instead of the receiver. Defensively, the New England front tightened against the run, but late in the fourth quarter, clinging to an 8-point lead, the Falcons made two brilliant plays to go win the game, then two horrific ones that ultimately choked it away. After a great directional kickoff by New England's Stephen Gostkowski, Atlanta began a drive at it's own 10-yard line with just under 6 minutes to play. The Falcons made a gutsy call, opting to throw the ball off of play action, and Freeman was wide open in the left flat after Ryan faked the handoff to him. Freeman ended up running 39 yards before being brought down, flipping the field and waking up a dormant Atlanta offense. Moments later, Ryan was flushed out of the pocket, and essentially threw up a prayer to a well-covered Julio Jones. That prayer was answered, as Jones hauled it in and tapped the toes to set the Falcons up in field goal range, at the Patriots 22, with less than five minutes to play. Surely, Atlanta would just run the ball, force New England to use all three of its timeouts, then kick the field goal to go up 11 and win the game. Or, they could call an elongated, downfield pass play, out of the shotgun, just two plays later, leading to a sack that lost 13 yards. What was once a chip shot field goal was now a 52-yard attempt from where Atlanta sat, but it got worse. After Ryan hit Mohamed Sanu for a 9-yard gain to move the Falcons closer, Jake Matthews was called for a hold, which pushed Atlanta back 10 yards from the previous spot. An incomplete pass led to the Falcons punting and, of course, the rest is history. Brady went full GOAT, Edelman threw his hat in the ring for greatest catch in Super Bowl history, and James White (who also set the record for most catches in a Super Bowl) finished things off in OT, after New England won the coin toss. Also, let's not forget about Dont'a Hightower's strip sack earlier in the fourth quarter that allowed New England to hang around. Another great example of New England making a massive play, and Atlanta choking, that turnover gave way to another quick Patriots score, when Ryan could have simply thrown the ball away. All this is not to take anything away from the Patriots, because one of the things Belichick-coached teams do best is let you beat yourself. When Atlanta lined up in the shotgun, with both backs IN FRONT of Matt Ryan, the Patriots defense knew it was a pass play, so Trey Flowers (and Dont'a Hightower again) pinned his ears back to get after Ryan, while the New England secondary carried the receivers down the field. A lesser defense would have been caught sleeping, and today we would be raving about Atlanta's guts to call that play in that circumstance. But not against this team. As Seattle learned two years ago when they got cute on the goal line, you're not going to catch the Patriots sleeping. So, have the Pats now won two titles that the other team PROBABLY could have locked up by just running the ball? Sure, but these are complete football games, and you need to close the Patriots out. As we've seen, that's easier said than done. 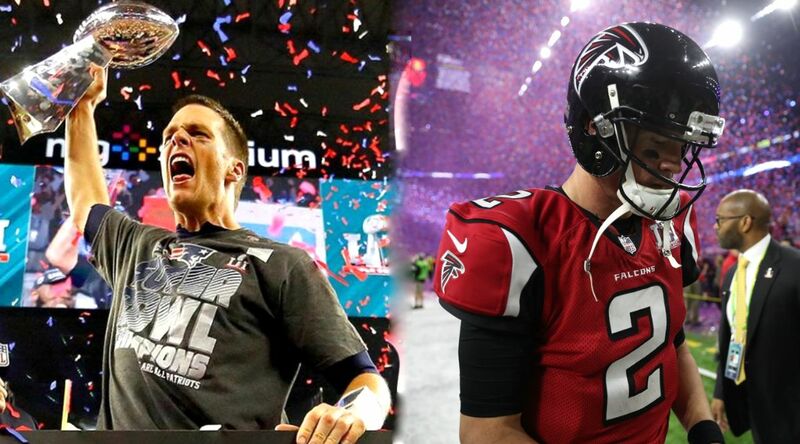 So, while Atlanta may have pulled off the biggest choke job in Super Bowl history, the Pats were still the Pats, and the Belichick/Brady era is now unquestionably the greatest run of success in NFL history.